Whether you own a beautiful handmade rug from around the world, a contemporary machine made, Navajo, or grandmas hand me down flat weave, we understand the importance of maintaining the life and characteristics of your rug. While you need to regularly clean your rug, you want to make sure you do so the right way, never risking damaging it in the process. 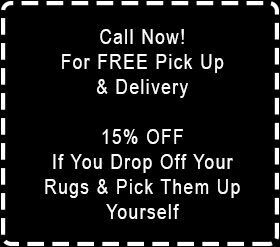 Fortunately, the technicians at Magic Rug Cleaners are wizards in the art of properly cleaning Oriental rugs. Not only do we understand that rugs are invaluable to their owners, but we also understand that all rugs have their own specific needs. Whether it’s a center piece for a rooms decor, a family heirloom, or beautiful antique, we’ll carefully evaluate each rug and clean it using the finest and most gentle cleaning agents. We use products that are 100 percent Wool Safe. For detailed information on our Cleaning process we encourage you to read “Our Cleaning Process” section of the website.